These bright red radishes are perfectly round and have pure white flesh of delightful flavor and crispness. Strong, short length tops make pickling easy. Roots remain firm long after picking. 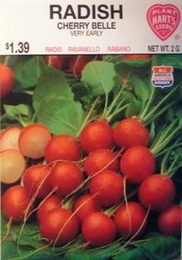 Radishes may be planted in the same row as slow growing kinds of vegetables such as carrots or lettuce. To grow the best Radishes, the crop must grow quickly, therefore, the soil must be loose and enriched with fertilizer and plenty of organic matter. 15lbs of Radish seed needed per acre. Average Radish yield per acre -475 bushels.